Missing a $LNKD in the chain? 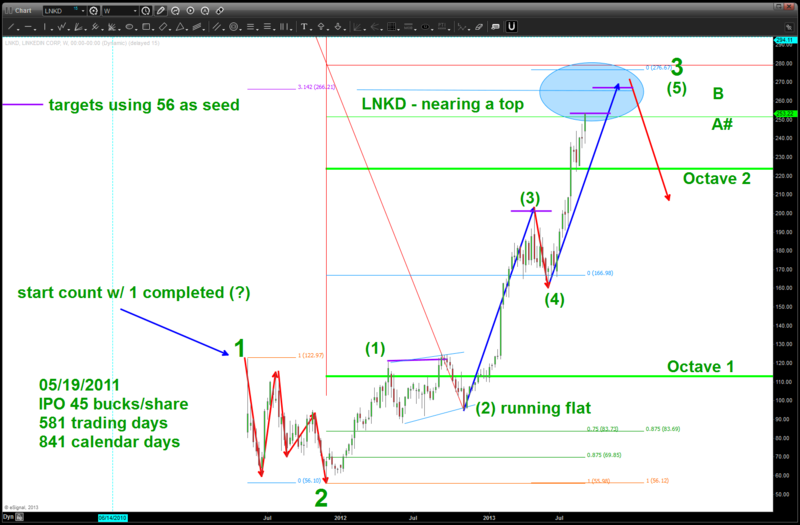 $LNKD on a great run … no doubt. However, certainly appears some stiff resistance is overhead. Wait for a signal reversal candle/bar (weekly) for confirmation that we are at/near a top. Notably, w/ IPO’s , it’s tough to count the initial move. In this case, an ASSUMPTION is made that the first correction from 122 – 56 is a 2 and then we go in a very strong and powerful wave 3. It’s “easy” to see 5 waves and w/ this much thrust/momentum I am inclined to say this is a 3 w/ a 4 to come and then another buy after a correction. The major corrections have lasted almost a year 1-2 and (1)-(2). The minor corrections (3)-(4) are a good 6 months long so caveat emptor is warranted from “now” to perhaps another 5-10% higher …. and, as always, rock on!